As you can see, the page displays a list of customers from the Customers table of the Northwind database. Each table row has an Edit link. Clicking on the Edit link takes you to the Edit view so that the customer details can be modified. (see below). Ok. Let's begin our development! The Customer class is mapped to the Customers table using the [Table] attribute and contains four public properties namely CustomerID, CompanyName, ContactName and Country. Basic validations such as [Required] and [StringLength] are also added to these properties. Then add NorthwindDbContext class to the Classes folder and write the following code to it. The NorthwindDbContext class represents our data context and hence inherits from the DbContext base class. It consists of a single DbSet - Customers. Notice how the OnConfiguring() method has been overridden to specify the database connection string. The overridden OnConfiguring() method supplies optionsBuilder parameter. The UseSqlServer() method accepts a database connection string. Recollect that we have stored the database connection string in the ConnectionString static property of the AppSettings class during startup of the application. The Index() action simply instantiates the NorthwindDbContext and fetches all the customers in the form of a List. This List is supplied to the Index view as its model. The @addTagHelper directive tells the framework to use Tag Helpers from the specified assembly. You will now get various tag helper related attributes in the Visual Studio intellisense. The Edit action receives a CustomerID as its parameter. Inside, the code fetches a Customer matching the supplied ID and passes it to the Edit view. The Edit view also needs a list of countries for the Country column. 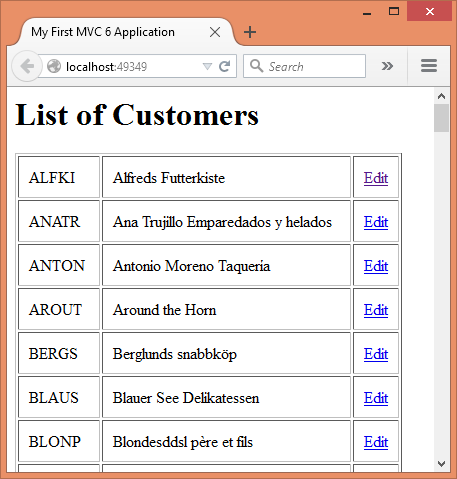 So, a List of SelectListItem (Microsoft.AspNet.Mvc.Rendering namespace) is created and filled with unique countries from the Customers table. This List is passed to the view through the Countries ViewBag property. The asp-action and asp-controller attributes of the form tag helper are set to Save and Home respectively. This way the form will be POSTed to the Save() action of the HomeController. The asp-for attribute of the label and the input tag helpers specify a model property that is bound with the label and the input field respectively. The asp-items attribute of the select tag helper specify that the <option> elements be generated from the Countries ViewBag property. The field level validations are displayed by adding <span> elements and setting their asp-validation-for attribute to the appropriate model property. This way the model validation errors will be displayed in the <span> elements. The validation summary is displayed in a <div> element by setting its asp-validation-summary attribute to ValidationSummary.All. The look and feel of the validation tag helpers is controlled through CSS classes - .field-validation-error and .validation-summary-errors (see top of the markup). The code that fills the Countries ViewBag property is same as before. Then the code checks whether the ModelState is valid using the IsValid property. 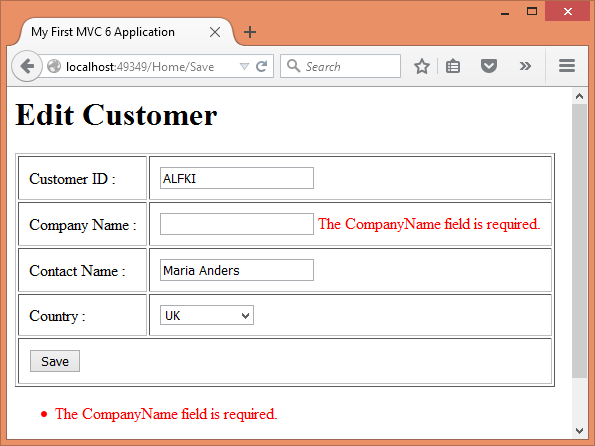 If the model state is valid the modified Customer details are saved to the database. This is done by setting the State property to Modified and then calling SaveChanges() method. That's it! Run the application and check if the customer details can be modified successfully. In this part you instantiated NorthwindDbContext locally. 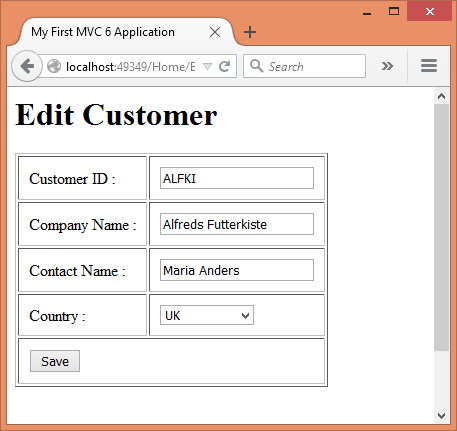 In the next part we will use MVC 6 dependency injection to inject it into the HomeController. Till then keep coding!